Astoria’s Community Board 1 rejected three livable streets projects Tuesday night, despite questions about whether the board even had enough members in attendance to take votes on the proposals. The three projects — a short bus lane on Astoria Boulevard, concrete barriers to protect cyclists on Vernon Boulevard, and a bike corral in front of a restaurant — fell victim to what appears to be leadership biased against projects that improve conditions for bus riders and cyclists. There were petitions both in support of the corral and against it, but Cawley and other meeting attendees said the board threw out supportive signatures from people who did not live within CB 1, including those from residents of nearby neighborhoods like Woodside or Jackson Heights. The board voted against the corral proposal. Cawley is now urging DOT to move ahead with installing it anyway. “Queens CB 1 is decidedly ‘anti-bike,'” she wrote to Transportation Commissioner Polly Trottenberg, after the meeting. “I feel disenfranchised by their constant ‘no’ votes to anything that would increase or improve bicycling infrastructure and safety.” DOT has not responded to questions asking whether it would install the bike corral. Cyclists weren’t the only CB 1 target. DOT had already received the board’s blessing to install a wider median and a plastic divider on westbound Astoria Boulevard to tame traffic as it approaches 31st Street [PDF]. DOT is looking to tweak the plan by adding a short bus lane for a few blocks of the same street. This would allow M60 Select Bus Service riders to skip ahead of traffic waiting for the stop light at 31st Street and save some time. But the board rejected that add-on. CB 1 also voted against installing concrete barriers along sections of the two-way bike lane on Vernon Boulevard. 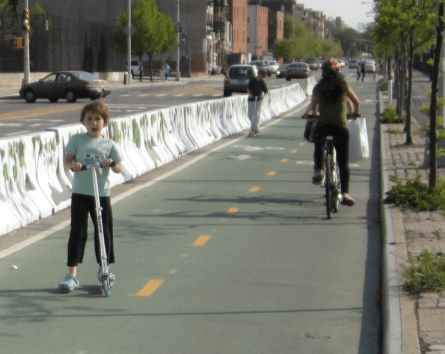 DOT had proposed the barriers, which it has installed on other greenway segments throughout the city, to protect cyclists from drivers at intersections [PDF]. The board supported barriers of some kind but rejected the concrete barriers as unsightly, and tabled the issue for further discussion. This reportedly led Vikram Sinha, the DOT representative at the meeting, to ask the board to come up with a better solution. Still a lot better than here. The path in that video looks pretty nice if you ask me, albeit a bit confusing with all those turns. I’d be very happy if most places to cycle here resembled that. I don’t recall any city overseas which has streets with miles and miles of traffic signals every 250 feet. That’s unique to the US. It’s probably even mostly unique to NYC. I’d really love to know exactly WTF our traffic engineers were thinking. From a cost standpoint alone, 20 signalized intersections per mile is absurd. On safety or other grounds, it’s totally unjustifiable. Outside of Manhattan where are there traffic lights every 250 feet for miles? Maybe not for miles, but places like downtown Flushing or Jamaica come to mind. There are lots of streets in the outer boroughs where you have quite a few segments with traffic signals every block, and then in between these segments you might have a signal every three or four blocks. I rarely see streets where you’ll go more than about 1/2 mile without encountering a traffic signal. These rare exceptions include streets like 75th Avenue between 164th Street and 199th Street ( two signals in 1.7 miles), some expressway service roads, parts of arterials which go through more desolate parts of the city, and of course the East River bridges. The point though is signals every 250 feet aren’t justifiable anywhere, including in Manhattan. At best the Manhattan Avenues need signals only at major cross streets like 42nd or 34th, although even here a two-lane roundabout would work better. In fact, intersections every 250 feet aren’t justifiable, period, at least for motor traffic. The Manhattan grid was designed back when you had horse-drawn carts going 6 mph. One block represented about 30 seconds of travel time. At 30 mph you can cover 1/4 mile in those same 30 seconds. That should be the distance between motor traffic blocks-at least 1/4 mile. You can have a finer grid permeable only to pedestrians or cyclists. Downtown flushing and Jamaica have enough foot traffic that signals are needed to manage traffic flow if you want vehicles to move ‘fast’. Bikes couldn’t ride at 15 mph there without them. Buses and trucks couldn’t get through either. Driving in both is high stress. The means low compliance at non signalized pedestrian crossings. It’s hard enough for many to cross with the lights, without them would be worse. Both should be avoided by through traffic, bike or motor vehcile, if it isn’t your destination. So why should those lights matter so much? You won’t get good compliance if you ask cars to stop for pedestrians every block without a light on a Manhattan avenue. How are you getting people safely across the street? Which lights specifically should be taken out? If you ban private cars from downtown Flushing and Jamaica, the traffic signals could go. You only need them because you have very heavy traffic with no natural gaps. Downtown flushing and Jamaica have enough foot traffic that signals are needed to manage traffic flow if you want vehicles to move ‘fast’. Bikes couldn’t ride at 15 mph there without them. What good are faster travel speeds when you’re stopped half the time? That’s the insanity of this entire system. You have traffic signals to allow 30 to 50 mph speeds, but half the time or more you’re stopped. If you’re lucky average speeds are 15 mph. Just let traffic move at 15-20 mph without stopping. 15-20 mph is still slow enough for uncontrolled intersections. As for the Manhattan Avenues, if you only have signals on major cross streets then when the lights go red there will be no traffic on all the streets in between. Maybe you might need another signal in between if the gap between major cross streets is ten blocks but the general principal holds. Once the light turns red, any vehicles not yet at that intersection will be stuck at the light. Once the vehicles which made the light are past, you have a gap to cross until the light changes wherever you want. Of course, this all assumes no vehicular traffic on minor cross streets which can turn onto avenues. That should be the case anyway. I can’t think of any good reason why vehicular traffic other than delivery vehicles should be allowed on minor cross streets. Another thing-many Manhattan Avenues have subways running down them. If a subway station is available, it should be the defacto way to cross. If need be put in ramps, but there’s no reason to cross at street level if you can cross using a subway station as an underpass. I cross Queens Boulevard and 71st Avenue all the time using the subway. I’m dumbfounded why anyone would want to cross that clusterf*ck at street level. Even if you have some trouble with stairs, using the subway is still preferable. It’s probably less time consuming as well given the ridiculously long wait times (plus the fact many people need two or three cycles to make it across). Most of them. Everywhere. Traffic signals are for one specific situation-intersections with poor lines of sight which can’t easily be corrected. Think places like the Park Avenue viaducts. Even there I’m not thrilled with the idea of relying on blind faith that people will obey a signal in order to cross, but the alternative is expensive grade separation of everybody. Everywhere else you don’t need them. I’m tired of hearing how they’re “needed” for people to cross the street. No, they’re not needed. If you have such heavy traffic that you have to resort to traffic signals to allow for gaps for people to cross, then you have a traffic volume problem which needs to be dealt with first. Do some combination of congestion taxes, banning curbside parking, banning private automobile ownership unless you have an off-street place to park, etc. There’s no reason because some tiny minority wants to drive everywhere that we should accommodate them. All of NYC’s traffic issues, including the carnage, stem from one fundamental problem-there is just too much motor traffic, period. If we refuse to try to fix that first, everything else we do is like trying to cure a gunshot wound with a bandaid. Far too many of the solutions people here suggest just involve adding more complexity to a system which is already demonstrably a monumental failure. Two words-traffic volume. Fix that and you fix everything. Interesting article. They suggest at the end perhaps NYC or Chicago should turn off their traffic signals for 6 months, then compare the results to before. The post clearly states that the bike corral was requested by a business owner. 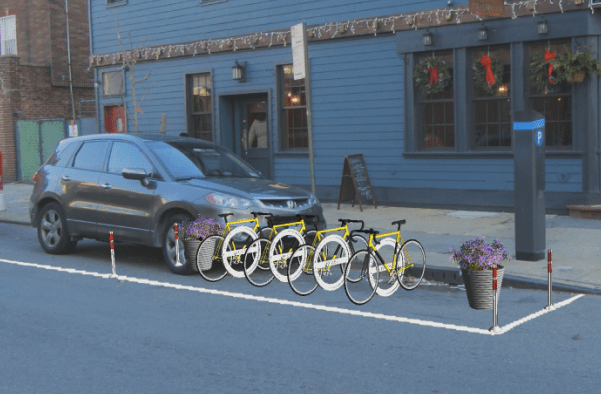 Please point to examples of CBs endorsing bike corrals — or anything — on the grounds that there is plenty of auto parking in their respective districts. Did they reject all the changes to Astoria Blvd or just the bus lane? That’s true. It was the CB that opposed to both the corral and the barrier; we don’t even know what the restaurant owner might have thought of the barrier. The point I was making was that a lot has to be done by the City before the CB – and local people including those like the restaurant owner that typically serve on CBs – will accept bikes as viable means of transportation. You can’t take away parking if demand for bike paths isn’t there in Astoria. Demand for bike paths won’t be there until the area is seen as a safe area to cycle in. Acceptance of bike paths depends on providing enough alternative parking, if roads are given over to bike paths. All these factors need to be considered before the central planners in City Hall impose their vision – as worthy as it may be – on a locality that is still “wedded” to the car. “Land use” generally refers to private land issues, such as zoning, variances etc. But that is an interesting question. That’s what happens when the average age of the Board hovers around 66. There needs to be more young blood on that board. Do you realize you sound EXACTLY like a driver complaining about traffic calming? 2) A stopped cyclist is vulnerable to getting rear-ended by an out-of-control vehicle and can’t easily start moving again in such an emergency. 3) A stopped cyclist is breathing fumes from idling vehicles. 4) When you stop, then put your foot down, it may end up in a pothole you didn’t notice. I’ve twisted ankles doing that. 5) There is the potential for repetitive stress injuries by repeatedly stopping. 6) A stopped bike is a target for miscreants and thieves. Possible hazards include objects thrown at you from passing cars, or even being robbed. None of these things, except maybe 1) and 3) are issues for motorists. Motorists complain about stopping often solely because it wastes time, maybe also fuel, although they can sometimes make up the lost time at lights by just driving faster. Motorists also sometimes have the option to go on highways with no traffic signals for part of their trip. Cyclists at present have no such option. If they did, I would be complaining a lot less vehemently about traffic signals. By the way, traffic lights have nothing at all to do with “traffic calming”. The fact that NYC sometimes uses them that way at the behest of ignorant community boards doesn’t make it so. Traffic lights exist solely to keep cars from colliding with each other. They make things bad for everyone else. I don’t think pedestrians like to wait 60 seconds at nearly every corner to cross streets any more than cyclists like to wait. The system has made everyone subservient to cars because cars are the chosen mode of the elite few. On another note, dislike of traffic signals seems to be one of the few things cyclists and motorists have in common. It’s a pity motorists aren’t more vocal on this issue. If they were, I bet they could get a whole bunch taken out. What is going wrong here in NYC? All of this is done and very obvious in SF.. I hope you can vote in better leaders or bribe the current ones. Way safer and more calming in Portland and SF. Come on, nyc! State law already says no parking within 30 feet of the corner or 20 feet of a crosswalk, unless official signs and markings say otherwise. Signs often do say otherwise, and even when they don’t enforcement is nonexistent.